Cobalt is a trace element, required by horses in tiny amounts. It is necessary for vitamin B12 synthesis, and as a result, is a key nutrient affecting several aspects of energy production, metabolism, appetite, and health. Along with copper, iron, B-vitamins, and other cofactors, it is involved in red blood cell production. Cobalt is naturally occurring in feeds, in quantities reflective of the soils in which they are grown. NRC 2011 lists several regions with soils known to be deficient in cobalt, including New Zealand and Australia. National Research Council (NRC) is an organization that compiles and publishes the internationally recognized standards for nutritional requirements for most species, in various stages of life, environmental conditions, and levels of work. NRC 2007 standards indicate that horses in hard work or under stress require at least 0.1mg of cobalt per kilogram of dry matter intake. Your average 500kg racehorse can be expected to eat 2% of their body weight per day, which would be 10kg of feed on a dry matter basis. 10kg dry matter intake X 0.1mg cobalt required per kg dry matter = 1mg of cobalt required per day for normal health. According to NRC, resting horses require about half of that. NRC 2011 standards list reduced minimum requirements, ranging from 0.5mg to 0.6mg, depending on age and level of work. Cobalt has become a very significant issue in racing over the past year or so. Following positive tests in Australia, racing authorities have made cautionary statements about the administration of cobalt to horses, and it has been reasonably well publicized that administering it at levels that result in the excretion of more than 100-200 micrograms of cobalt per litre of urine (depending on the racing jurisdiction) will result in a positive test. What hasn’t been explained is how much cobalt you can safely feed before those levels are reached. Racing jurisdictions have been working towards finding that threshold but have not yet released any information. On a more basic level, horsemen and veterinarians have been provided with very limited information about the impact of “normal” levels of cobalt in the feed on the cobalt levels in urine. “Normal” levels may be significantly less than the threshold doses that will eventually be established. Instead, regulatory authorities have said that cobalt deficiencies are not common in horses, and they have recommended that it should be eliminated, as much as possible, from the equine diet until data is published indicating the maximum amount that can be fed. In general, feed companies use NRC guidelines when developing formulations, so most complete feeds will contain at least 1mg of cobalt per day, when fed as directed. Many racing stables, however, feed simple diets, comprised of unimproved pasture, home-grown hay, haylage, and chaff, supplemented with oats or barley. It is often necessary to top-dress these rations with broad-spectrum vitamin and mineral supplements to ensure that all nutrient requirements are met. Based on the cautionary statements issued by some racing authorities about feeding cobalt, horsemen are now unsure if it is safe to continue feeding their usual preparations. Withholding all nutritional supplements, however, may not be the best approach, as far as equine health and welfare are concerned. Some diets will almost certainly be left deficient in at least some vitamins and minerals. 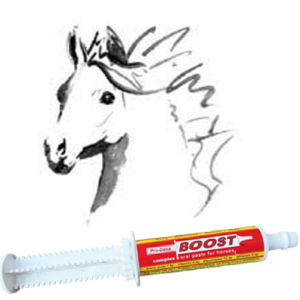 Pro-Dosa BOOST is a complete, balanced, bioavailable multi-nutrient paste, developed to replace nutrients lost in hard work or required in greater doses when horses are under stress as a result of travel, racing, competition, or illness. Nutrients are provided in doses that directly reflect NRC requirements, so Pro-Dosa BOOST contains 1mg of cobalt. It is generally only used once or twice a week, on days in which horses are under greater stress, and is not a daily supplement. It has been widely used in racehorses and competitive horses of all types in 35 countries for the past 14 years. It has undergone in vivo clearance testing numerous times across Australasia and has previously been fed extensively in those markets, right up until race day, without incident. Currently, Pro-Dosa International Ltd fields weekly enquiries about the safety of feeding Pro-Dosa BOOST and/or normal rations to racehorses. While the industry awaits peer-reviewed research to be published by regulatory agencies regarding maximum amounts of cobalt that can be fed on a daily or weekly basis without producing a positive test, we wanted to be able to answer questions about the cobalt levels in urine after feeding small amounts of cobalt, that are simply reflective of accepted requirements. The purpose of our study was to measure the amount of cobalt excreted in the urine of horses in race training, fed a combination of typical, prepared feeds and home-grown forages, and then to quantify the increase in the amount of cobalt excreted in urine following the administration of an additional 1mg cobalt (provided as cobalt sulphate in Pro-Dosa BOOST) a very bioavailable form of the trace mineral. We have conducted a fairly short, practical study of urine cobalt levels in horses given a small quantity (1mg) of cobalt sulphate, a dose that reflects the nutrient requirements of a horse in hard work as published by NRC (National Research Council) in 2007. An “hypothesis” is what is expected to occur. 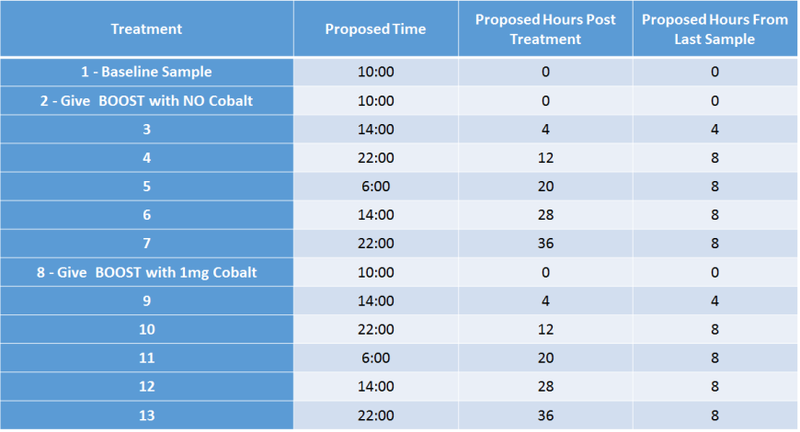 Since NRC recommends the daily administration of 1mg cobalt, we expected that 1mg of cobalt would be cleared within 24 hours, and since NRC suggests that horses actually require that much cobalt, we might have expected that no waste cobalt would be excreted at all when 1mg was fed. As the standardized diet, however, was understood to contain some cobalt, we actually expected (or hypothesized) that the administration of an additional 1mg, might produce a small increase in the amount of cobalt excreted. Feed analysis was conducted at Hill Laboratories, an accredited feed testing facility. Results indicated that the basic feed items including chaff, haylage, and barley did not, on their own, contain enough cobalt to meet requirements as set out by NRC. Two of the prepared feeds appeared to. Cobalt content in each feed constituent ranged from 0.009 mg/kg to 1.667 mg/kg on an as fed basis. (See Figure 2) A complete feed analysis is available if requested. Treatments were given and samples were collected close to the planned schedule. Urine cobalt analyses were performed by Eurofins, Wellington, a laboratory accredited for that test. They are not a racing laboratory, however. While the trends appeared to be quite consistent, there was some individual variation between horses, with one horse excreting double the cobalt compared to the other two at baseline. (See Figures 3 & 4) The horses were all of similar size, ranging from 425-450kg, and one of the two larger horses had the higher cobalt excretion values. Results indicated a slight reduction in urinary cobalt following the administration of the portion of Pro-Dosa BOOST containing no cobalt (the negative control), and in two of the horses, that reduction was to a level below detectable limits. The reduction in cobalt concentration in urine occurred between 4 hours and 12 hours, with levels staying low until some time after 20 hours. By 28 hours after feeding Pro-Dosa BOOST without cobalt, cobalt excretion had returned to levels close to baseline. After feeding the portion of Pro-Dosa BOOST with 1mg of cobalt, urinary excretion of cobalt remained essentially unchanged from baseline. Statistical analyses performed by the University of Auckland, Department of Statistics, demonstrated no statistical significance of the very slight increases in two horses or the slight decrease the other. To get a perspective on the amount of cobalt excreted after feeding a basic, un-supplemented ration and the additional effect of feeding 1mg of cobalt in comparison to threshold levels that would produce a positive drug test, see Figure 5. It is important to understand that the number of horses used in this study was very small. A larger number of horses and a larger number of samples would be needed to draw statistically significant conclusions. Until this study was completed, we did not know what sort of data we might get, if any at all, and the cost was quite high. We had intended to repeat the study in a second and third stable, but only after looking at preliminary data. Unfortunately, it was more difficult to collect the samples than expected. After the first day or two of urinating in pots, the horses stopped cooperating, and the final sample could only be collected from one horse. With no additional data to compare it to, that data was discarded. Had the urine collection been easier, a second, larger group of horses could have been used to obtain more results. As it stands, few stables would be likely to volunteer to participate in a follow up study, especially if they talked to the trainer and staff who were involved in this one. It was originally planned that blood samples would be taken in addition to urine, but that had to be abandoned as no laboratory that was accredited to do cobalt analysis in blood or serum was willing to participate. If a suitable laboratory can be identified, serum cobalt may be measured in a second study. That would be easier, and I’m sure racing stables would happily participate. Despite the limitations in our data set, the results were interesting, and we have achieved some of our goals. We are now able to answer questions regarding the amount of cobalt excreted in urine compared to threshold levels, in a small group of horses in training, fed a diet, fairly typical of racing stables in the Auckland, New Zealand region. In general, urinary cobalt was quite low compared to threshold levels, with our group averaging a baseline excretion of only 2.97 mcg/L while the threshold for drug testing has been set 67 times higher at 200 mcg/L in New Zealand and Australia. The study group of horses was eating 4.64mg of cobalt per day; with 3mg coming from one feed source, and only very small amounts coming from the forage and plain barley. While this cannot be considered an indication of all basic feed stuffs, it is reasonable to assume that at least some un-supplemented rations, comprised of basic feed constituents, with no pre-mixed feeds included may be quite low in dietary cobalt. Additionally, we established that feeding 1mg extra cobalt, provided as cobalt sulphate, did not significantly increase cobalt levels in urine. Our group demonstrated a very slight reduction over 12 hours with a return to baseline levels or just slightly above by 20-28 hours. This change was not statistically different from baseline, though. Finally, the negative control samples showed some interesting trends. The reduction in cobalt clearance was small, but very consistent. It occurred between 4 and 12 hours and lasted for 20 hours. This reduction could have resulted from increased water consumption and increased urine output, thereby reducing the concentration of cobalt. Urine output was not measured in this study, however, and nor was water consumption. Both would be useful and may be examined in subsequent studies. The second possible explanation is that, by feeding Pro-Dosa BOOST, which provides a broad range of elements required for metabolism, energy, and red blood cell production, the utilization of existing dietary cobalt was improved, leaving less to be excreted as waste. In either case, the implications for health, performance, and recovery are positive. We are now confident that feeding Pro-Dosa BOOST according to directions will not contribute to increased levels of urinary cobalt excretion. We are comfortable that the levels of urinary cobalt excretion found in our study are much less than that which would place horses at risk for a positive drug test. Pro-Dosa BOOST increased water consumption, improved hydration, and increased urine output. Pro-Dosa BOOST improved cobalt utilization from the diet, reducing the amount that was excreted, unused, as waste. If a racing laboratory can be found who is willing to do analyses on blood or who might do urine assays at a more competitive price, and if horsemen volunteer to participate, additional studies could be completed. These would provide more confidence in the results and give trainers reassurance that feeding rations and supplements that are adequate to meet nutritional requirements will be safe when presenting horses at the races. Pro-Dosa Int’l would like to acknowledge Derek Balle Racing Stables, Pukekohe, New Zealand for participating in the study and for collecting all the samples. We really can’t thank you enough!